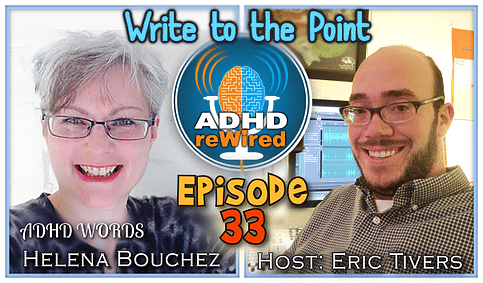 A writing coach and communications consultant recently diagnosed with ADHD, our guest Helena Bouchez walks us through her story of self awareness and discovery of ADHD. Having worked around an airport for a number of years, Helena likens some of her strategies for dealing with ADHD to metaphors of flight terminology. Helena also divulges some strategies for writing business emails effectively and making sure that your most important emails aren’t riddled with spelling and grammar errors. Also discussed is the idea of optimizing one’s time on a particular task versus trying to be perfect. Worked as communications consultant and storyteller for creative firms for the past seven years. Helps creative people and artists better communicate their ideas in the business world. Decided to read Ned Hallowell’s Driven to Distraction. Within the first thirty pages, she broke into tears at how much it described what she had been experiencing. Was okay when listening to a “wall of sound” of her boyfriend practicing music, but can’t focus when the TV is on while another person is talking. Found the interjection-filled pace of conversation on the East Coast hard to manage compared to the more patient wait-and-respond pace of Mid-Western conversation. Eric: Had to have a heavy-duty door installed at his office because a co-worker’s adjacent office meeting would be too distracting. Upon taking medication for the first time, she was surprised when she was able to speak confidently, clearly, and coherently without much effort; she could finally access her thoughts. When writing notes, she developed a word-skipping shorthand that enables her to write down the entire lecture as it is spoken. Writing with pen and paper can make it easier to retain what one writes about. Eric: Uses Evernote in conjunction with emails to forward and automatically categorize messages to his account. Tag words in email subject lines with “!”, “@”, and “#” to set the time, desired notebook, or tags for the message. Helena: Fewer notebooks within Evernote, and more organization though tagging. Eric: Uses canned responses in Evernote to speed up the sending of similar messages. Feels she has long-term time blindness: it’s hard for her to conceptualize multiple years worth of time and goals. Beginner pilots fly using Visual Flight Rules, where they use what they can see to orient and drive the plane. More advanced pilots learn to fly with Instrument Flight Rules, where they can fly their plane solely by looking at the instruments’ readouts. If Helena were to use Visual Flight Rules for her life, she would be lost, never finding her destination or taking a long time to arrive. She must instead trust her instruments – in this case her plans. It’s okay to trust and rely on your plans in order to not be distracted. Plan ahead to find a reasonable and efficient path, then follow that plan. Helena: I need to accept that I may miss opportunities and options. That needs to be okay in order to accomplish one’s goals. Wondered if applying ADHD structures would help those clients she felt displayed traits of ADHD. This protocol helps those with ADHD focus on writing one subject at a time and avoid writing bloated emails. It was originally taught by Margo Mateas from prtrainer.com. Most adults’ writing problems are foundational and based in one’s thinking patterns. Writing at the end of the day can make you more prone to make mistakes. Write important emails in the morning, take a short break, then go back and proof-read them. Proof-reading and writing are two separate tasks that use two separate parts of the brain. Eric would rather have five separate emails, each with their own separate topic, than one large email. Eric: Most people decide whether to respond to an email within seven seconds of opening it. As a writer, Helena has a hard time figuring out when a piece of writing is finished. Eric: The amount of time needed to squeeze out the last 15% of quality on a work is much more excessive than the time needed to reach the first 85%. Usually 75% is good enough. Helena: For business purposes, 75% might be okay, but when looking at writing as a personal artistic endeavor, it’s hard to not aim for 100% quality. Eric: Give yourself permission to aim for 80% quality, then you may have the opportunity to create more work. Draw a large box on a piece of paper. Label one edge of the box “Start” and the opposing edge “Goal”. Draw a line down the center, splitting the box in half so it looks like a soccer field. Now draw a line from Start to Goal that stops halfway there. Draw another line from where you left off that extends half of the remaining distance. Repeat this a few times. Give me three book titles you would never write. If you could have one guest over for dinner, who would it be? If you just made their favorite dish and burnt it, what would you do?